COLUMBIA, S.C. -- When Richland County Senior Deputy Ben Fields was filmed on Oct. 26 wrapping his forearm around the neck of a South Carolina high school student, flipping her and her desk backward onto the floor, and tossing her several feet across a classroom, it set off a national outcry that quickly led to his suspension, and then firing. 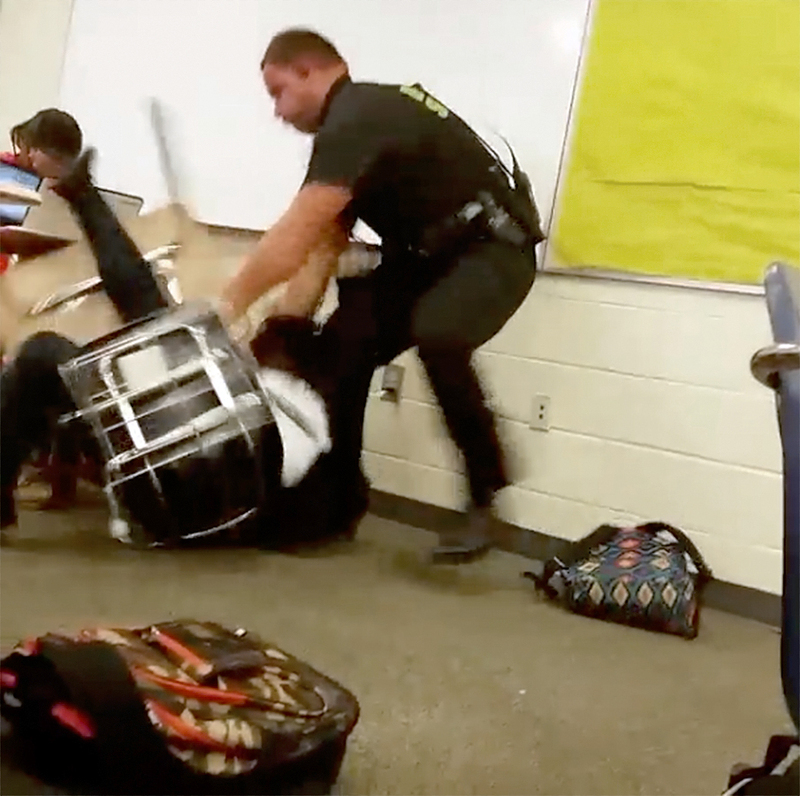 Fields' "use of force was unacceptable" and he "did not follow proper training, proper procedure" when he "threw her across the classroom," Sheriff Leon Lott said Wednesday, in announcing Fields' dismissal. But the rules for acceptable tactics for officers assigned to schools varies from town to town, experts tell 48 Hours' Crimesider. That's partly because school resource officers are trained by local police, and each department has its own standards for use-of-force, according to Mo Canady, Executive Director of the National Association of School Resource Officers (NASRO). And Canady says each department approaches the assignment of school resource officers differently. He acknowledges that in some jurisdictions, disgruntled or poorly performing officers are sent to schools. "That's absolutely not how it's supposed to be," Canady said. "This has to be one of the best officers in your department. They're going to be among your most visible officers, and your most-well known in the community." NASRO provides officer training -- often paid for through grants from the Justice Department's Community Oriented Policing Services (COPS) office -- that emphasizes mediation, and steering youths away from the criminal justice system. It's an approach that's supported by the non-profit Council of State Governments, which wrote in a report last year that "police should not be engaged in routine classroom management, and whenever possible should use alternatives to arrest for students' minor offenses that can be appropriately addressed through the school's discipline system." South Carolina is among just a handful of states where NASRO is barred from training school resource officers, said Canady. It's not clear whether Fields participated in extra training related to working in a school, and The South Carolina Association of School Resource Officers did not reply to requests for comment related to Officer Fields' actions on Oct. 26. Classmates of the student who was arrested by Fields told CBS News that the confrontation began when a teacher and school administrator repeatedly asked the student to put away her cell phone during class. When the student allegedly didn't comply, Fields was called in to remove the student. "You're going to come with me or I'm gonna make you," Fields can be heard telling the student in cell phone video. "Put your hands behind your back. Give me your hands, give me your hands." Moments later, the girl and her desk had been flipped over, and Fields could be seen propelling her toward the front of the classroom. He then handcuffed her. Fields also arrested a second girl who allegedly verbally objected to his actions. Both girls were charged with disturbing schools, a South Carolina misdemeanor that makes it illegal to "interfere with or to disturb in any way ... the students or teachers of any school," or "to act in an obnoxious manner" in a school. "That can be a fine line in a school, as to whether a student who is misbehaving has done something arrestable," Canady said. Because laws like South Carolina's measure against disturbing schools are particularly broad and open to interpretation, schools and police departments should have memorandums of understanding about what the school resource officer's role is, according to Bernard Melekian, the former director of the Justice Department's COPS office. "Assisting the school personnel in having a student removed from class can be appropriate, the question is whether or not the student should be charged and brought into the criminal justice system," Melekian said. "In my opinion, in most cases the answer is 'No.'" But as the use of School Resource Officers has spread since the 1990s -- when COPS began awarding grants to law enforcement agencies for the hiring of school officers -- so has the likelihood that students find themselves handcuffed. "Research suggests that the presence of SROs (school resource officers) might result in more children being involved in the criminal justice system for relatively minor offenses," analysts for the Congressional Research Service wrote in 2013. "This, in turn, can result in other negative consequences, such as higher rates of suspension or a greater likelihood of dropping-out of school." It's not clear what will happen to the two students as a result of the "disturbing schools" charges pressed by Fields, but one thing is certain -- their interactions with Fields did not go the way Melekian and Canady would have wanted. "I've never seen something quite like that before," Canady said. "This is supposed to be about providing security and dealing with the issues that come up with students, helping them resolve issues that come up in the criminal justice system," Melekian said. "And encouraging a positive relationship between the students and police."